I woke up this morning in a very pensive mood. I have a lot to do at work, I have a lot of books taking up space in both my living room and my purse that I have to finish reading and I’m locked out of the audiobooks section of the library, because once again, I couldn’t return my library books on time. To top it all off, McAfee says I’m not protected because the virus software can’t get past 4% when scanning. When am I going to find the time to fix that? I download my email and glance at it, convinced that only bad news can arrive. I have a comment on my article for Blogcritics, The Ladies of Friday Night article. 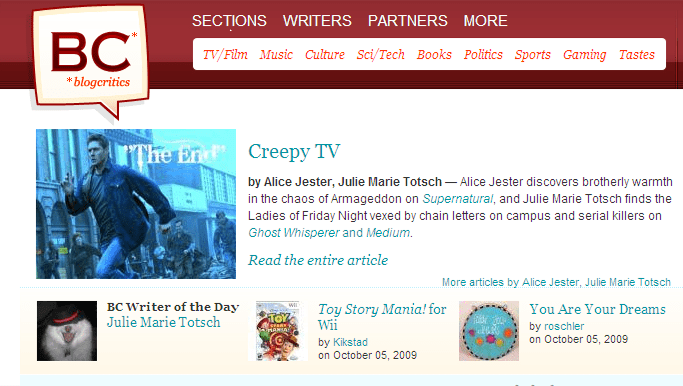 In case you don’t know, for this TV season, I’m recapping Ghost Whisperer and Medium. Well, since I am full of myself, I decide to read the comment and the writer mentions that I am the Blogcritics writer of the day! I am blown away! Little old me! Woo Hoo! On top of that, my article is mentioned! Way to go Me! I know I should be a way more humbled person, but sometimes it is nice to see your hard work rewarded. And, after the week I had at my paying job last week, I could use a little reward this week. Good for you. Visiting you after reading your comments on Obama and the Nobel peace prize on BlogCritics.